Rosa rugosa ‘Hansa’ Friend or Foe? 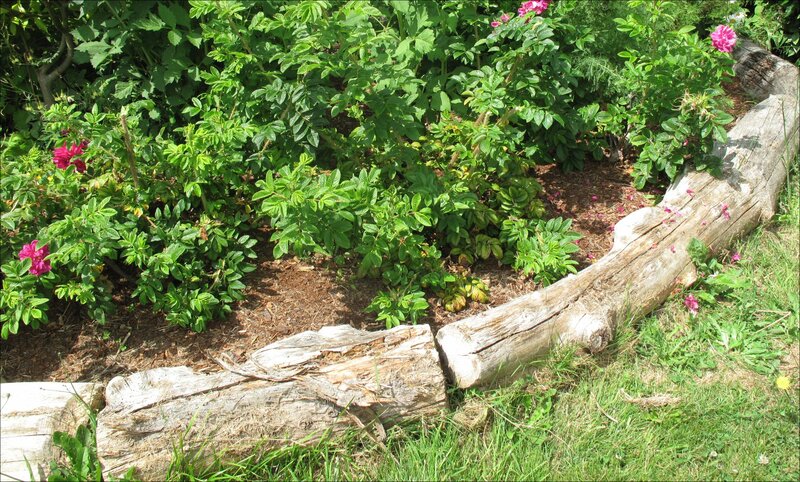 Rosa rugosa hails from the East Asia, a native of a wide region spanning China, Korea and Japan. Depending on your perspective, the species and cultivars like Hansa are attractive hardy deciduous shrubs that resist common rose diseases, bloom profusely with a heavenly scent, require minimal care and naturalize easily, or are invasive plants that disrupt and compete with native plants, especially in sensitive coastal habitats. I bought four ‘Hansa’ plants in gallon pots sometime in the spring of 2010, never got them in the ground that first year, but did manage to pot them up to larger five gallon plastic pots. What followed was at least a year or two of neglect, including planting them in a location that required moving and loss of one plant. I moved the three remaining to a new bed early this spring. I’m very happy with results, though at the front of the border I’ll probably have to prune fairly hard since their habit is upright and I would like to keep them no higher than three feet. I have many Washington state natives and don’t see Hansa in danger of taking over in my garden or the surrounding ecosystem. It appears to be a problem in sandy coastal areas from Maine to New England (where it may have been deliberately planted to mitigate beach erosion) and all over Europe, where it was first introduced in the 18th century. 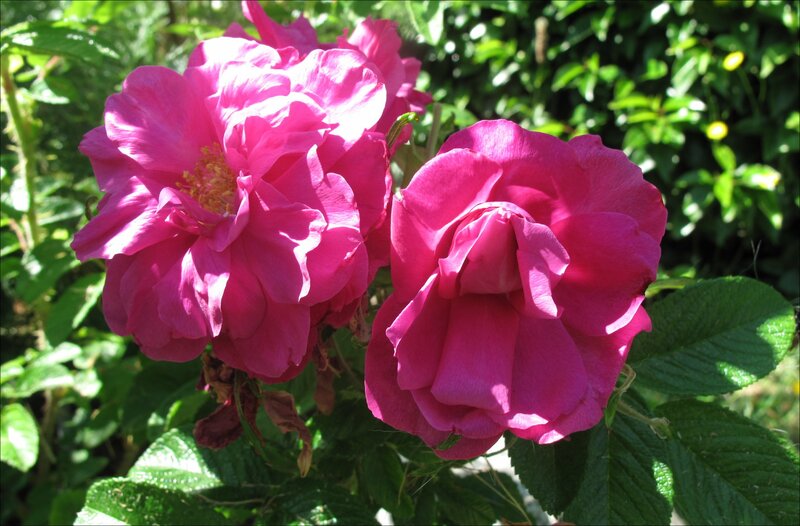 Besides the wonderful scented blooms, Hansa has such beautiful leaves that never seem to succumb to the myriad of problems other roses suffer in our moist climate. 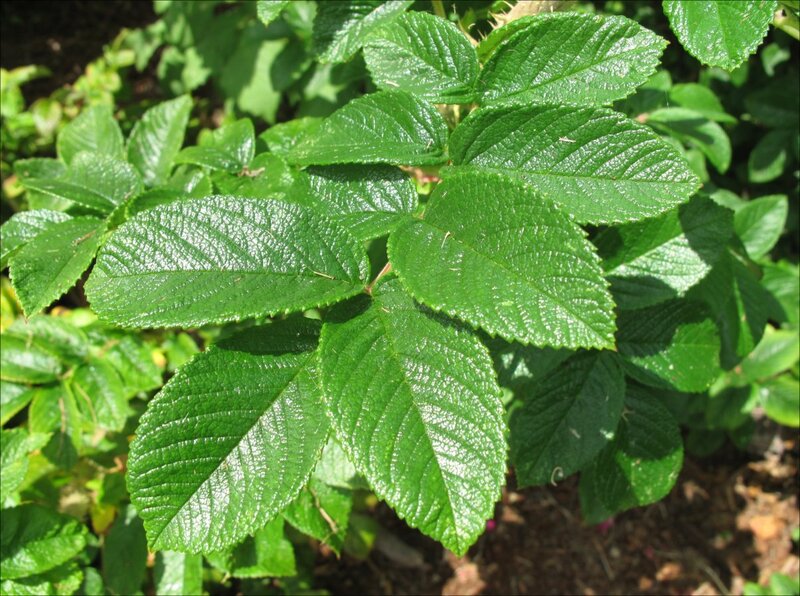 This entry was posted in Plant Picks and tagged Invasive species, Rosa rugosa, Rosa rugosa Hansa by Bart Arenson. Bookmark the permalink.